Hello everyone, it's your old friend Blade here. I have two things to discuss tonight. After 10 freaking years since Fortress of Forgotten Souls I am here to announce my new tileset. So it happened that late last month I got activated from my Jazz Jackrabbit 2 hibernation. It probably was the recent news about JJ1 and JJ2 entering GOG.com which made me return to these forums. Then I happened to stumble on that thread about Another Dimension and how the fellow player Lem_Gambino somehow still plays that episode. I could not help myself of testing out the thing, and then The Episode and then Energized Action. And just like that I found the inspiration to move forward with a new tileset and now, a month later, I am confident enough to make it public. Allow me to be sentimental here for a bit. About a week ago my latest J2O release, Fortress, turned ten years old. This spring marks the 20th anniversary of the release of Jazz Jackrabbit 2. I am myself steadily approaching the ripe age of 32 this summer. My whole adult life fits between this moment and the release of Fortress (don't mean to offend anyone who's 21 or under, this is a personal observation looking back). That very thought makes me all nostalgic. Returning to the process of drawing a new tileset and to be able to be here and to talk to you guys after all these years is a huge deal for me. The feeling is similar to reading old diary entries (the good ones): you can't help feeling warm and fuzzy inside. So I'd like to extend my thank yous to everyone reading this post for being part of this community for all these years and keeping the game and community alive. And to the precious folks who keep J2O running I offer each of you a lengthy, firm, Nordic handshake. Thank you for being able to be years and years away from the scene and after getting a random spur of inspiration, J2O is still here. Anyway, for now, I want to keep the theme and name of my tileset under wraps. I can say, though, that this tileset is not the one announced as "Winter War" back in 2008. It's still unfinished and will probably stay that way. It's been a long time since I got introduced to JJ2+ but I am quite sure it was the gaming site Rock Paper Shotgun which relayed the word of it to me. Thankfully JJ2+ is very well documented and so far I have been enjoying it to the fullest. There are some things which I'd like to ask and have answers to. Mostly about the direction tileset making has been going in the recent years. I would appreciate a lot your input in this matter. 1) I know that JJ2+ makes those large TSF tileset sizes available to everyone. Are there any downsides to creating for example 2000 tile tileset? (other than probably tileset that large will be hard to comprehend) Does anybody make large tilesets now that it's feasible? 2) How do people use JJ2 tilesets these days? Are single player episodes still a thing? Is AngelScript a must have in all levels now? 4) Any other tileset related things I should know about? That's all I can think of. Thanks a lot. I appreciate your time. About the new tileset and its eventual release: there is still much work to be done, but at some point this spring you'll be able to download it with an accompanying example single-player level. Could be a month, could be two. Check this thread for (infrequent) updates. It's possible to put destruct scenery events on flipped tiles now, so there's not much reason to include tiles in a tileset that are mirrors of one another, since the F key can do that with no downside. Tiles may also be flipped vertically now, which may or may not be useful for any given tileset design. People like to make their own palettes for their levels--this is easiest if the tileset's palette is organized into gradients. Fortunately, you already do this! It's also possible to directly import tiles from one tileset into a level using another tileset. This is another reason to have your palette be well-organized, since it makes it easier to work with the imported tiles' colors, but it's also a good reason to make sure related tiles are next to each other in a tileset. Fortunately, everyone already does this. As a side effect of the above, there's a limited utility in including tiles taken directly from other tilesets in your tileset, e.g. the standard JJ2 poles or destruct blocks or textured background. Fortunately, you already draw your own variants of those. Hi and nice to finally see you here! I've seen your name so frequently in tilesets! This all makes me really excited! Good luck with your tileset, I'm sure it's going to be awesome! Angelscript is nice and all but still it isn't a must-have. While making your tileset compatible with the cool features VioletCLM already mentioned, to some degree it should still be usable in regular JJ2 1.24 at least. Looking forward to the new tileset! I guess you could leave out tiles that can be gotten through flipping as well now, as Violet says, but they're still very convenient to have, so I wouldn't necessarily do that if you're not hurting for space. A nordic handshake from your Finnish brother in blood as well! I'm very hyped to hear about your upcoming tileset! There are no real downsides. However, few people create tilesets at all nowadays, and more tiles means more time spent in development, so huge tilesets remain uncommon for now. 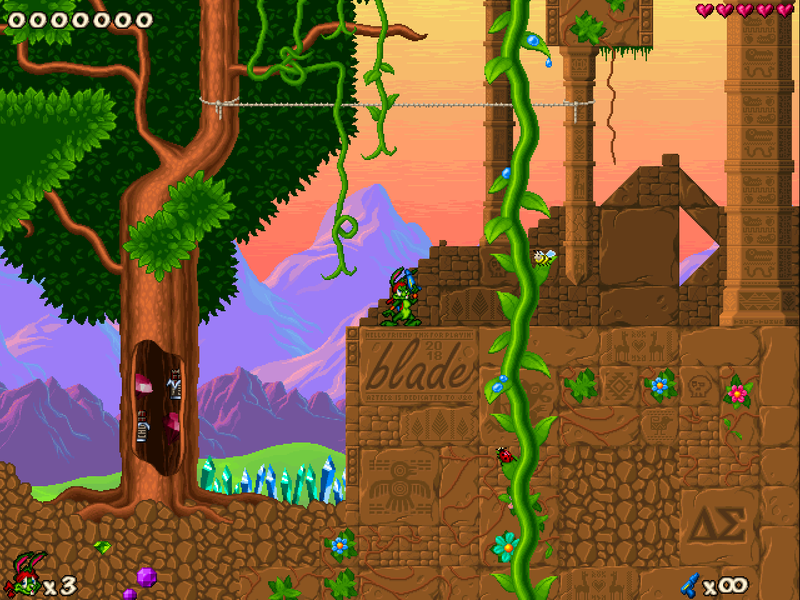 Scripting makes it possible to use multiple tilesets in a single level and change their palette on the run. As a result, in pursuit of originality and enticing visuals, it's becoming very common to mix and match tilesets, modify their color schemes, introduce new elements, etc. Sometimes people will load Jungle background into a Carrotus level, other times darken foreground tiles and place them in the background. I'm inclined to say those are things for level designers to worry about, not tileset artists. Single player hasn't been the most popular game mode to create levels for recently, with multiplayer uploads being much more common, but it's still around, and episodes do occasionally happen - such as Holiday Hare '17, uploaded just a month ago by community effort. AngelScript is very commonplace, but by no means a requirement. It's most often used for small gameplay modifications and cosmetic touch-ups, and rather rarely utilized to its full potential. Personally I don't think there's anything useful for scripting that you could include in a tileset. A tileset should contain tiles, and for all visuals that have no business being used as tiles, custom sprite sets (j2a files) are a better fit. This, in fact, has some potential consequences in tileset design. Some original and interesting solutions from the past could be considered suboptimal nowadays. For example, if you recall the keys and fireballs in Agama's Heaven, or some chess piece enemies from Kejero's Tomb Rabbit 2, things like those would nowadays be much better accomplished by sprites and scripts. Keys could be actual pickups and give you points, fireballs could be actual projectiles and explode upon impact, whereas chess pieces could be actual enemies and be damaged by bullets. If you have original ideas along those lines that perhaps aren't quite fit for being tiles, consider attaching a dedicated sprite set to your tileset instead. If you don't write scripts yourself, you shouldn't have any trouble finding someone to either help you or do it for you, e.g. in the thread made specifically for that purpose. That about sums it up. Much like I said, any scripted features are usually the responsibility of the level designer, not tileset artist. Although, I would like to say tiles dedicated to indicating instant death pits are always welcome. It can be as subtle as some cave tiles fading to pitch black towards the bottom, or far more literal like some imagery involving skulls and crossbones, as long as the message becomes clear after at most one fall. It's something I commonly find missing. Scripting also enables inserting more layers into a level. This means that your tileset may reasonably have more than the usual 2 or 3 dedicated background layers, as well as that no one will get mad if it doesn't have a separate cave version of every masked tile (although some people, such as those who prefer JCS over MLLE, may still find it preferable). The maximum resolution supported by JJ2+ is 800x600, compared to the previous 640x480. Many tileset backgrounds don't utilize vertical space very well and cover only a small fraction of that space. Foregrounds often include small visual details that are not very significant. That's not ideal. Try to think big. JJ2+ introduces 3 new tile types: invisible, heat effect, and frozen. It may be worth experimenting with them to see if you can utilize them in any way. It also introduces 3 new textured background modes, and background fade position may be modified. Using scripting, water may be moved to different layers or made invisible, and its color may be modified. It's possible to enable lighting effects even when water is active. AngelScript has a feature known as layer sprite modes. It's quite inefficient and as a result its uses are niche, but it's also reasonably possible to experiment with. Hopefully, this was an extensive but not overwhelming answer. Think of scripting and JJ2+ features as means to achieve more freedom, not enforce more requirements. Much like I said, we haven't had many new tilesets recently, and we deal with what we have just fine, attempting to give them fresh looks thanks to AngelScript, so you don't have to necessarily do anything differently. We'll welcome any new tileset with open hands. Last edited by Sir Ementaler; Jan 28, 2018 at 01:14 PM. Good luck on your new tileset! I have nothing more to add to the answers that have already been said in this thread. I'm pretty much a noob when it comes to scripting so I mostly rely on 'adapting' existing scripts and using anything JCS (with plusified JCS.ini) & MLLE can do. Aztec 2 is a revisit to my oldest proper tileset and the idea for this set was actually thought up ten years ago. I really didn't think I would make it happen but here we are. In Aztec 2 you will find familiar Aztec elements such as clean square tile blocks, hanging vegetation, goofy Greek letters and a mountain range in the background. The tileset features highly customisable tree building tiles, something that throws back to the one small sad tree in original Aztec. The tileset has a textured background, but so far I have preferred this simple reddish sky. The tileset currently sits at 1430 tiles and this will still go up. I need to add some vital eye candy tiles, but all should be ready for launch after that is done. During creation of Aztec 2 I was obviously inspired (and still am) by a multitude of pixel artists. I studied quite a lot pixel art for this tileset and some thank yous will be in order once I release this tileset. The trees and its leaves are definitely Agama-esque even if my tree trunks are not as large as in Agama's fabled Swamp tileset. Additionally thank you for all the answers you have provided me in this thread. Your words were really useful and and I feel considerably less like a noob. I hope this sneak peek has brought you joy and if you have something to comment on, please do. Last edited by Blade; Feb 18, 2018 at 04:23 PM. Incredible work. I had high expectations and you surpassed them. I love the color scheme and the tile variety. Good work on the background, too. Definitely the kind of thing I had in mind when I said to think big and utilize space well. The background grass looks to me like it could use some anti-aliasing or an outline. Other than that, the crystal spikes don't entirely look like they belong. Perhaps it's also the lack of an outline, or just that they look unfavorable in front of the grass because their shapes are hard to discern. The green/purple gems on the bottom left could use some shadow or outside border or other way to blend better in the rocks. This is beautiful!! I always felt like the original Aztec doesn't fully live up to its name, despite being a fun tileset to use, but this? This is gorgeous! Amazing! The level of detail this has is fantastic! It looks easy to use and, what's more, it even has some clear references to the original Aztec which I like! Well done! Keep up the good work and maybe you can make a nice example level for it as well? aka. great work. greetings from a flagbrother. I especially like the color scheme and aesthetics of the background layers, as well as the shading and small details of the temple tiles. Definitely an original take on the old jungle temple theme, as well as a worthy homage to your Aztec set. Keep up the exciting job on this set! Looks astonishing so far! Looking forward to the release of this nice piece of art! 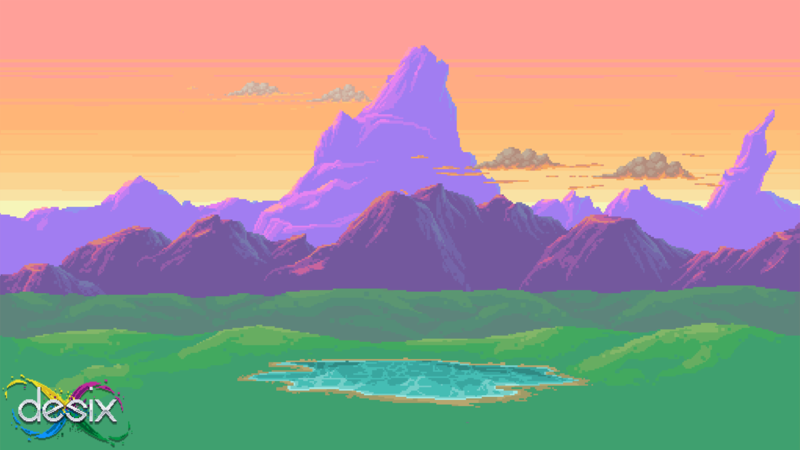 The background mountains have some lovely soft coloring, and you're doing a great job having the tiles not look too tiley! Even the various 32x32 blocks look nice and curved, reminiscent of the walls in Castle. The gems and roots in the bottom left look a little pasted on right now, though, with the surrounding rocks not having their shading altered at all around the outlines, and I wonder if you could find a color for the plants that's a little less pure green. Thank you, again, everyone for your amazingly supportive words and constructive critisism. Most of your comments revolved around the clearly unfinished part of Aztec 2. The gems are currently separate tiles and to make use of them one has to stick them to layer 3 and the result is this unpolished look. The background layer 5 grassy hills are definitely unfinished and the way they are displayed in the screenshot is not at all advantageous. Damnit, I've been looking at this tileset for far too long now. I will work hard to bring this tileset to completion as soon as possible. By the way, I will gladly accept suggestions for Aztec 2 title module music. If you have any suitable tracks in mind, please give me a holler. I can't seem to find proper, well-made module music for the specific mood I am trying to portray in the tileset, even after scouring through hundreds of tracks in Modland.com archives. Blade! The man, the myth, the legend, one of the main pillars of our community . The amount of times I've played a level made with your tilesets...I can't count them. Welcome back to the bunny Fortress, and I hope your return to making tilesets will be like a proverbial walk in the Twilight park. I'm looking forward to your new tileset! My best match so far is The Hidden Empire. It fits, it loops, and it's never been used in a J2O upload. Though the sample quality could be better, and it might not be the mood you're going for. I am stopping by for a small update on Aztec 2. It's nearly finished. It really only needs polishing applied to the background layer tiles and the tileset is good to go. I will probably also add some eye candy as it seems I am a bit of an perfectionist and can't get the idea out of my head that this tileset needs POTS. It just can't be released to J2O without some ample quantity of ancient pottery. Aztec 2 currently sits at 2100 tiles. Sorry for that, I could not contain myself. But if it's any consolation, there should be a lot of neat stuff to play around with. And thank you Sir Ementaler for the song recommendation. It is quite hard to find suitable songs with this subject matter. Thank you for informing us! I am super excited! And the number of tiles isn't a big deal at all! Didn't get around to commenting earlier, but this looks great! Always nice to see more tileset work, and it's motivating me to put more work into one of my own unfinished sets. Looking forward to the full release! Curiosity: are you an employee or something of Desix? Because your background does kind of resemble this landscape they've been advertising for a couple years (which itself has been compared to a Lion King background), and I was wondering if there was any relation there. You are definitely onto something here and I have to say, you have super keen eyes. No, I am not an employee of Desix. But yes, you have found the inspiration picture I used as a reference for the background in Aztec 2 (actually, the exact image is this ). In Desix's work I found exactly the kind of atmosphere I wanted in Aztec 2 so I sought out to have a similar aesthethic. As a result one can see similarities between my work and the Desix's with the most outstanding similarity being the color palette. The colors used in Aztec 2 are indeed close to the original with my work having more reddish and bluish hues. Despite the colorspace similarity, all of the background in Aztec 2 is my own work, pixel-by-pixel. I have no delusions about this, my work does look a lot like the one I drew inspiration from. I have asked some friends about the similarities and they have indicated to me that to them this is no problem. You may remember earlier in this thread when I said that when released I need to send out some thanks for the inspiration. I want to stress out that in no point I intended to hide similarities between my work and the work of others. What do you guys think? Am I crossing a line here? If it is decided my background work on Aztec 2 is too much like Desix's work, I will just have redo my background art. Last edited by Blade; Apr 16, 2018 at 01:55 AM. I'm really excited about this tileset and it would be a shame to see it delayed because of this. At the end of the day, I think a new tileset would be appreciated by everyone in the JJ2 community. It's fine, and also good looking. I do hope those clouds are a layer of their own though. Yeah, just go with the current background. I don't really mind so long as you're upfront about it and give credit, and it seems you're doing that. Both versions look good and unique in their own ways. It seems that I am doing monthly updates on Aztec 2 now. This should actually be the last one. The news is that Aztec 2 is 99,5 % done and currently I am building the single player example level out of the tileset. Sadly the pace of development has dropped quite drastically during this last month so it is important for me that I get this thing released as soon as possible. The tileset now has 2360 tiles, and it's possible that I'll still make some additions to it while building the level/beta-testing my own tileset. The amount of tiles ensures a staggering amount of possibilities for your level, but please take this with a pinch of salt. I have deliberately left some connecting tiles undone with the logic being that I do have to finish this tileset eventually. With the release of Aztec 2 you can actually expect have two separate example levels with the second one being a bit of a surprise, hopefully. Expect the release of Aztec 2 in a few weeks! Cheers everybody and thank you for all your support. Thank you for keeping us updated! No need to rush the additions! When you are fully satisfied with your work, so are we! Take your time! "The tileset now has 2360 tiles"
Really excited for the release of this tileset! Just a quick message: Release of Aztec 2 is very, very imminent. Be sure to check out J2O downloads soon. I expect to release this thing in 8 to 36 hours. Contrary to what I said before, Aztec 2 will be released with one example single player level instead of two. Sorry about that unfounded promise. I'll discuss the reasons in a later post. A heartfelt thank you for your interest in Aztec 2 and in all my tilesets which came before. Kiitos. Haha, how dissappointing: I am on the verge of Aztec 2 upload, but the uploading throws me with an error message. I'd like to get this up and running tonight. Violet or Stijn, are you present?